You can easily find GPS Coordinates of your current location or any other location using your smartphone or computer. 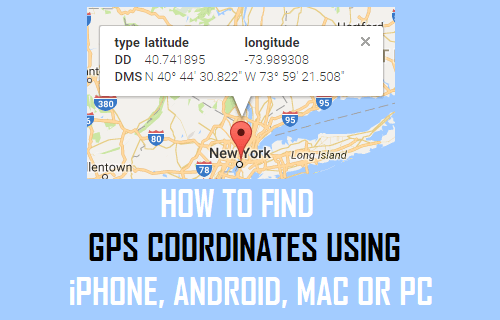 If this sounds interesting, continue reading below to find out more about GPS Coordinates and how to find GPS Coordinates using iPhone, Android Phone, Mac or PC. GPS coordinates can be described as a set of alphanumeric characters (40° 41′ 21″ N 74° 2′ 40″ W) indicating the geographic location of a place in terms of Latitudes and Longitudes. The first set of numbers (40° 41′ 21″ N) are providing you with the Latitude information, indicating that Statue of Liberty is located 40 degrees, 41 minutes and 21 seconds to the north of the Equator. The second set of numbers (74° 2′ 40″ W) are providing you with the Longitude information, indicating that Statue of Liberty is located 74 degrees, 2 minutes and 40 seconds to the west of the Prime Meridian. In order to understand this better, you will need to clearly understand the following terms. Latitudes: Are measured North or South of the Equator and vary from 0 degrees at the Equator to +90 degrees at the North Pole and -90 degrees at the South Pole (See image below). Prime Meridian: Can be defined as an imaginary line running from North to South of the Earth through Greenwich in England, United Kingdom (See image above). Prime Meridian divides the Earth into Eastern and Western hemispheres – just like Equator divides the Earth into Northern and Southern hemispheres. 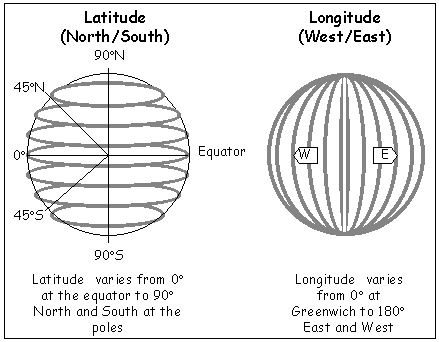 Interesting Info: One degree of Latitude covers about 69 miles or 111 Kilometers. Luckily, most of us do not have to worry about GPS Coordinates, as this interesting but difficult and precise task is performed in the background by our gadgets which take care of geotagging photos and providing us with directions based on GPS calculations. However, in case you are interested in knowing your exact location on the surface of Earth, you can make use of your iPhone, Android Phone, Mac or PC to find the exact GPS Coordinates of your current Location and of any other Location that you are interested in. 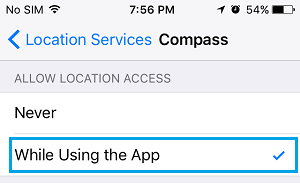 In order to find GPS Coordinates on iPhone, you will have to allow the Compass App on your iPhone to access your location data by following the steps below. 2. 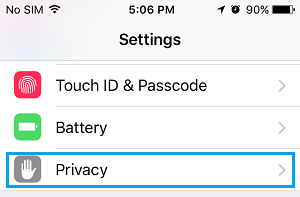 On the Settings screen, tap on Privacy. 3. 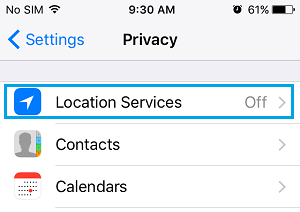 On the Privacy Screen, tap on Location services option. 4. 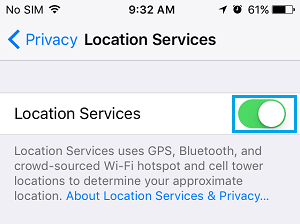 On the Location Services Screen, make sure that Location Services option is set to ON Position (See image below). 5. On the same screen, scroll down and tap on Compass. 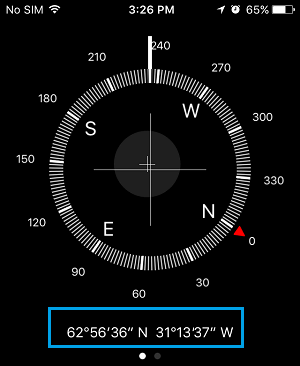 Once the Compass App is able to access your location, it will start displaying GPS Coordinates on your iPhone. In case you have an Android Phone, you can find GPS Coordinates using the Google Maps App. 1. Open Google Maps app on your Android Phone or Tablet. 2. 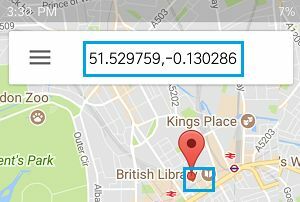 Press and Hold on a Location until you see a red pin – you will see the GPS Coordinates of this place in the search box (See image below). Note: This feature of Google Maps does not work on the iOS version of Google Maps. 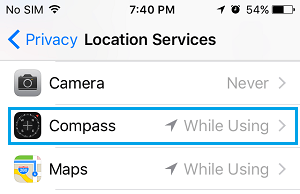 iPhone allows users to input GPS coordinates into Google Maps, but prevents Google Maps from providing GPS Coordinates. You can find GPS coordinates on your Mac or Windows computer by using the web version of Google Maps. 1. On your PC or Mac go to maps.google.com. 3. Now, take a look at the Address bar, you will see coordinates of the place at the end of the URL (See image above).